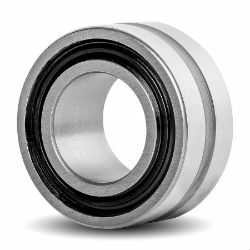 Bearings with an inner ring are used if the shaft is not configured as a rolling bearing raceway. The bearings are greased using the lithium complex soap grease GA08. Arcanol LOAD150 is suitable for relubrication. For this purpose, the outer ring has a lubrication groove and a lubrication hole. The bearings can be sealed against external influences using sealing rings of series G, GR and SD in combination with wider inner rings IR. The sealing rings and inner rings are matched to the needle roller bearings. The outer surface of the inner rings can be used as the sliding surface for seal lips. Sealing rings: see link, and TPI 128, Sealing rings, single lip and double lip.